Aside from what appears to be a viscious and intentional effort to reduce our book sales on Amazon.com (you see we are conspriracy theorists after all! ), the overwhelming majority of reviews have been favorable. We have yet to hear from a single expert specialty physician who has controverted our scenario in any significant way. Our article in Neurology Today. What was FDR's Deadly Secret? The currrent issue of the American Academy of Neurology publication Neurology Today contains a long and well-written article on our book. This comment was left by an anonymous reader but since it epitomizes many that have been posed, I felt compelled to address it. The commentors remarks are in regular type and I have interjected my answers in Italics. No autopsy was performed because it would have revealed many facts about FDR's health that were hidden then and many that are still hidden today. There have been many FOIA (freedom of information act) requests over the years, a nunber of which have reavealed considerable information, vis a vis those of Kenneth Crispell and Carlos Gomez in 1981. Virtually every Roosevelt historian interested in pursuing FDR's health has gone down this avenue. There is very little that can be accomplished with further requests. 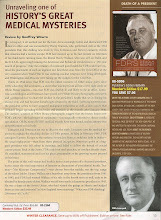 a cranky reviewer on amazon suggests that fdr's reading by hand was due to failing eyesight - astigmatism from old age and that he had used that method since 1938 rather than de novo during the congressional report as this book reports although the reviewer offers no proof about the old age causation. the reviewer you mention is a non-physician with an obvious desire to discredit the book. his ideas about failing eyesight are laughingly inept. Our conclusions are based on four years of intensive research in consultation with hundres of top physicians. I am a board certified neurologist and stand by my findings without qualification. If the commentor can produce a single expert of equal standing, I would be more apt to listen. To this point, none of the hundreds of my colleagues have found reason to dispute my findings. See our blog post that discusses Guillain Barre Syndrome. FDR had polio. Likewise, the diverticulitis theory has been discussed with dozens of board certified gastroenterologists and surgeons and is not the reason for the GI bleed.